We manufacture dip mouldings which are known for its effective functioning among our valued clients. These are most appropriate for the short and the long production run and have the lower startup tooling cost as compared to the regular injection moulding. The fully functional prototypes can be provide before investing in the full production tooling a and has the dip moulding process which erases the parting lines, mould marks and flash from the finished plastic parts. We offer coupler covers which are known for its effective functioning among our valued clients. It is manufactured from high quality of raw material which is procured from genuine vendors. These covers are primarily used in the wiring harness of the two wheelers. It is manufactured in accordance of requisite norms and standards. We manufacture insulation sleeves which are manufactured from high quality of raw material. The raw material comprises of PVC which provides the extra insulation which help in the protection of the wire. It is extensively used in wire harness, cable and battry industry. It is manufactured in accordance of requisite norms and standards and is delivered within stipulated time frame. We are engaged in manufacturing PVC vinyl coating which helps in protecting the surface of the metal from the corrosion and from the dirt and dust in the environment. This dip coating also helps in the protecting from electrical shock and damage. This helps in providing a shiny and the glossy look to the complete structure. 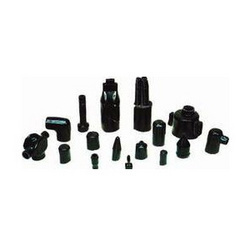 It is also used for the insulation of the metal part and is manufactured in accordance of requisite norms and standards. We are engaged in manufacturing grips or tools handles which are highly durable and offered good comfort through the flexibility.It can be made in glossy, matt and the foam finish in various colors according to client requirement. It is manufactured in accordance of necessary standards and can be delivered within given time frame.